This post is brought to you with the support of the Peanut Bureau of Canada. If you're anything like us here at FBC, then Peanut Butter is pretty much its own food group when it comes to meal planning. In our office we eat it in sandwiches, use it for dipping our apple slices, smash it up with bananas on toast and pump up our green smoothies with it. So that's great for breakfast, lunch and snacks... but what about adding peanut butter to dinner? That's our dream! 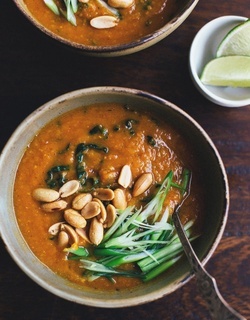 [Sweet Potato and Peanut Stew](http://fromthelandweliveon.com/sweet-potato-and-peanut-stew-w-kale/) from** From The Land We Live On**. **[Slow Cooker Ginger and Peanut Chicken](http://sweetpeasandsaffron.com/2016/04/slow-cooker-ginger-peanut-chicken-green-beans-baby-potatoes.html)** from **Sweet Peas and Saffron**. **[Buckwheat Noodle Salad](https://www.timeforgrub.com/site/blog/2016/01/26/bragging-right-buckwheat-noodle-salad-with-winter-vegetables)** from **Grub by Eating Niagara**. **[Peanut Butter Hummus](https://tastespace.wordpress.com/2010/02/27/peanut-butter-hummus/)** from **The Taste Space**. **[Thai Flank Steak Kebobs](http://www.peanutbureau.ca/recipes/entrees/373-thai-flank-steak-kebobs.html)** from **The Peanut Bureau of Canada**. **[Asian Inspired Chicken Leg Quarters](http://thecookiewriter.com/asian-inspired-chicken-leg-quarters/)** from **The Cookie Writer**. **[Spicy Peanut Soba Noodles with Pork](https://dishnthekitchen.wordpress.com/2014/06/16/spicy-peanut-soba-noodles-with-pork/)** from **Dish 'N' The Kitchen**. **[Thai Style Buddha Bowl](http://leelalicious.com/thai-style-buddha-bowl/)** from **Leelalicious**. **[Chicken Satay with Peanut Sauce](http://foodwhine.com/2011/05/chicken-satay-with-peanut-sauce.html)** from **Food and Whine**. **[Asian Cucumber Salad](https://vanfoodies.com/2014/07/21/recipe-asian-cucumber-salad/)** from **VanFoodies**. If you loved the look of the Thai Flank Steak Kebobs you'll want to watch this short recipe video! You can get the recipe for these tasty Thai Flank Steak Kebobs along with lots of other great peanut recipe ideas at www.peanutbureau.ca. A big thank you to all our FBC Members who participated in this weekend's savoury peanut butter recipe roundup. Wow! These all sounds fantastic. I have always wanted to try more savoury dishes with peanut butter. I can’t wait to give a few a try.